After the days out of school due to the snow storm started to run together, I decided the boys needed some structure before their brain cells all dissolved and slipped away into oblivion. They began doing worksheets in math and reading, and I came up with a few special projects. One day, I told them they all had to write compositions. But these weren't just any compositions. They had to write an original scary story. With pictures! And that evening, the grand finale would be getting to read them to their dad and I with the lights out, by camping lantern. You wouldn't believe how excited three little boys were about this special treat. 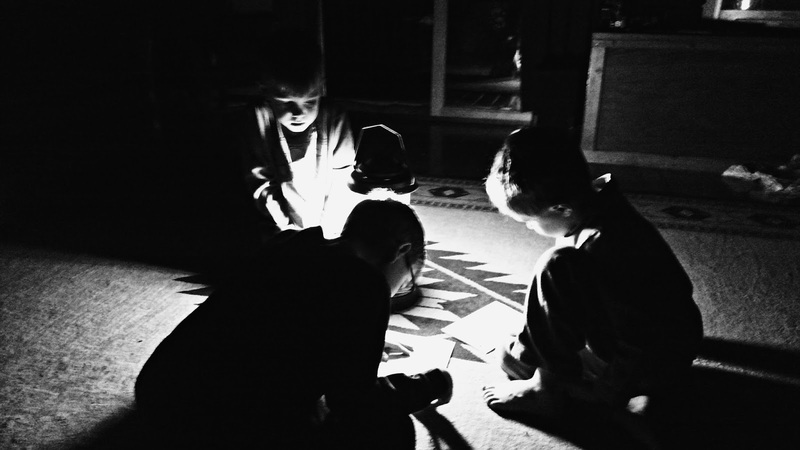 They worked very diligently on their scary stories. Cort wrote about a zombie goldfish. Reid wrote about a werewolf called Reid. And Pierce wrote about an evil chatbot. True to form, they read their stories to us that evening, by camping lantern. We all shivered with delight and applauded. See, busywork really can be fun! I would have loved to have a teacher like you; or to have had one for my daughter. What a great memory for them and perhaps they'll pass it down to their children. What a great idea, My mother always had a rainy day box of goodies she would get out when we were stuck in the house for long. I just loved teaching creative writing! We also created superheroes using Powerpoint! That was fun. I love this! You are a fun mom! What a creative activity for your boys! Good idea! Sounds like a fun night. What a great project! And I love what they came up with! That is amazing,! And each really wrote a story? Oh it would be fun to hear the storys! I don't know what a chatbot is but it sounds evil. That would have been fun for the whole family. Good idea, mom. fabulous photo and idea!! I do not know what a chatbot is so shall be learning something new in a few second 'google' :-). How fun! I should try this with my kids. The week our kids had 2 days off they were stir crazy on that following Saturday. Travis took them out for a walk. When they came back he said, "Ok now write something that happened on our walk that is made up." Isaak loved the assignment. Mica rushed through it a little more, but still came up with something creative.